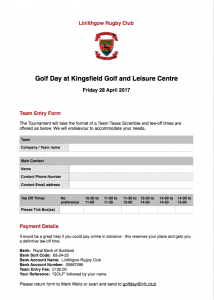 Thanks to Robert Arkley and his team at Kingsfield Golf and Leisure Centre, the Rugby Club will again be holding a Golf Day at Kingsfield to help raise money both for youth rugby at Linlithgow and for the Scottish charity the Bill McLaren Foundation. We are looking for teams of 4 people to participate – team entry fee will be £120. The format will be a Team Texas Scramble and tee-off times are being offered from 10-30am to 12-00pm or from 1-30pm to 3pm. The day finishes off at the Rugby Club with a barbecue and prize giving from 7pm, although the bar will be open earlier for thirsty golfers! We will be throwing in a few fun challenges on the day and individuals will be able to purchase a special Bill McLaren Charity ticket on the day, giving them a bacon roll in the morning and a burger and bottle of beer in the evening, together with free entry to the raffle and to the various fun challenges along the way – longest putt, straightest drive and more. Park Up at The Rugby Club and Let Us Drive You to the Tee! 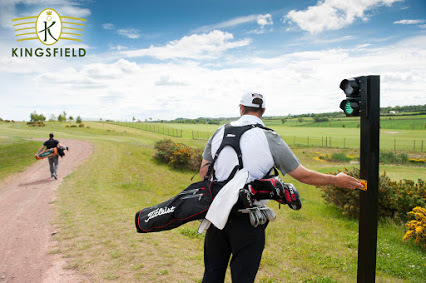 Why not park your car (or get dropped off) at the Rugby Club and take advantage of our free transport offer to and from Kingsfield Golf Centre? To reserve a team for the Tournament all you need to do is download and complete the form below and send to golfday@lrfc.club Alternatively you can phone any of those below to register your interest.